FORMER ANGLO IRISH Irish Bank CEO David Drumm has pleaded guilty to authorising or permitting illegal loans to be given to ten businessmen in 2008 to buy shares in the bank. Drumm (51) of Skerries, Co Dublin was transferred to Dublin Circuit Criminal Court this morning from Mountjoy Prison, where he is currently serving a six-year sentence for conspiracy to defraud and false accounting. Wearing a white polo t-shirt and blue jeans, Drumm stood in the dock and replied “guilty” to ten charges of providing the loans to the so-called Maple 10 group of developers and businessmen. 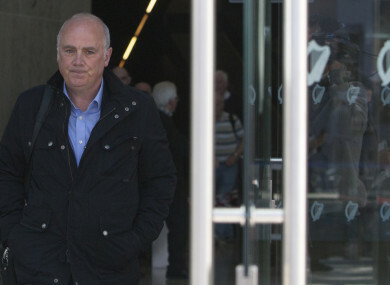 Drumm pleaded guilty to ten counts of authorising or permitting Anglo Irish Bank to give unlawful financial assistance for the purchase of bank shares to Brian O’Farrell, Gerard Conlon, Gerard Maguire, John McCabe, Joseph O’Reilly, Patrick Kearney, Patrick McKillan, Seamus Ross and Sean Reilly between 10 and 17 July 2008. He had been due to face trial in October but this has now been cancelled. Paul O’Higgins SC, prosecuting, said the DPP intends to withdraw the remaining 21 charges listed on the indictment against Drumm. Drumm was jailed last week after a jury returned unanimous verdicts of guilty on a charge of conspiracy to defraud and false accounting, following an 87-day trial. Judge Karen O’Connor remanded him in custody for sentence on 9 July. Email “David Drumm pleads guilty to role in providing unlawful loans to the 'Maple 10'”. Feedback on “David Drumm pleads guilty to role in providing unlawful loans to the 'Maple 10'”.